The hyperinflation that ripped through Zimbabwe in the first decade of this century / millennium was an economic and societal catastrophe. The currency was officially and fully demonetized in 2015 but the nation of Zimbabwe is continuing to try to dig its way out of the devastation caused by the hyperinflation and other disastrous government policies and programs. It is somewhat ironic, and I’m sure more than a little chagrin inducing for the people of that country, to think that the 100 Trillion dollar note and some of the others in that series have become such a popular novelty item and that the 100 Trillion notes are now worth $100-350 to American collectors. However, I’ve recently come across / learned about something that seemingly adds quite a bit of insult to this injury. Since the genuine notes have become so popular and expensive, not everyone wants to pay that much for them. And, the joys of capitalism being what they are, someone seems to have stepped in to fill that need / void. Some person or company in China has been mass producing these gold colored copies of the 100 Trillion dollar note. They’re plastic and covered in a gold-colored foil - there is no real gold content. They do not have serial numbers. They are not and never were real notes and the Reserve Bank of Zimbabwe has nothing to do with them. They’re on eBay going for $8-10 for lots of 10 of them - so super cheap. I see the gold coloring as mixed blessing. 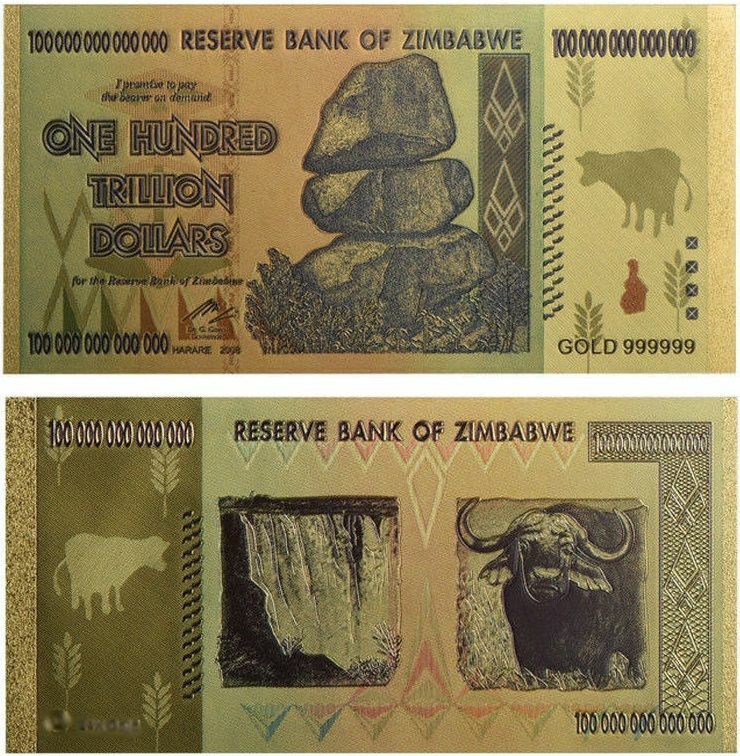 Since they’re gold in color and shiny, where the true 100 Trillion note is mostly blue, no one is ever going to make the mistake of thinking that these are the original 100 Trillion note. There's also a silver version out there that I think does a better job of replicating the look of the original notes but it's basically the same as the gold version in terms of what it is and where it comes from. I think some of the sellers on eBay don’t do a good enough job of emphasizing that these things are from China and not any kind of official issue and that Zimbabwe / the government thereof wasn’t involved in making them, but what can you do there? On the other hand, because the coloring is all wrong, having one of these in hand doesn’t give you a feel for what the original looks like or feels like. I also find the gold color tacky and gawdy to the extreme. There’s just something so peculiar about taking something that became famous for being part of the last gasp of a dying currency, something that is famous for being 100 Trillion Dollars and, yet, somehow, still being too worthless to buy a loaf of bread and making it gold-colored. It’s like the person that made these just fundamentally failed to understand this event and what these things were and what they mean. These things are not a sign of or indicative of affluence or prosperity or opulence, as you would expect with something made golden. They’re associated with a terrible chapter of that nation’s history - a period of deprivation, scarcity, fear, want, hardship and loss. I can’t imagine what a native of the country who lived through that decade would think of these things and I don’t know if they’d laugh or cry.